Commentary: Elon Musk may be an innovation genius, but at Ford Motor and Boeing Commercial Airplanes before that, Alan Mulally has shown he is a manufacturing genius, argues columnist Joe Nocera. The early 2000s were a terrible time for Ford Motor Co. It was losing billions of dollars — $6 billion in the third quarter of 2006 alone — while shuttering factories and laying off tens of thousands of workers. Its products were stale, its stock was in the single digits and its executives were at war with each other. Oh, and its chief executive, Bill Ford, then in his mid-40s, was in way over his head. Ford, of course, was a member of the founding family, whose control of the special Class B shares gave them 40 percent of the voting power. As part of the cutbacks, the company had reduced its dividend, which directly affected the pocketbooks of the CEO’s relatives. Bill Ford was thus highly motivated to right the ship, so much so that he was willing to recognize that he needed to find someone who could manage the company better than he could. Ford found Alan Mulally, who took the reins in September 2006, after a long and successful career with Boeing. “In less than three years,” writes Bryce G. Hoffman in his 2012 book “American Icon,” a resurgent Ford would wow Wall Street with quarter after quarter of profit at a time when most companies were still reeling from the worst economic crisis since the Great Depression. Mulally would be heralded as the architect of one of the greatest turnarounds in business history. One reason Ford didn’t go bankrupt is that Mulally led an audacious effort to borrow $23.6 billion — which required mortgaging all the company’s assets — but which gave the company the money it needed to turn the ship around. Another is that Mulally changed the company culture, insisting on straight talk even when the news was bad, and ending the backbiting. A third is that he got both executives and factory workers aligned behind a series of straightforward, understandable goals. And finally, under Mulally, Ford made cars that appealed to consumers. The parallels between a new company trying to revolutionize the car business and a century-old company trying to reverse its fortunes are inexact. But Tesla today is in at least as much trouble as Ford was then, probably closer to bankruptcy than to successfully manufacturing a mass-market electric car. Musk is an astonishing entrepreneur and innovator, but his panicky tweets these past few months have shown that he, like Bill Ford, is in over his head, at least as a chief executive. He needs to put a steady hand in charge, someone who can run the place with the calm and experience he lacks. He needs Alan Mulally. Let’s list a few of the things Mulally could bring to Tesla. Thanks to its penchant for overpromising and underdelivering — not to mention Musk’s tweets — Tesla has lost the confidence of Wall Street. A guy who once borrowed $23.6 billion while consistently overdelivering quarterly profits would have a far better chance of regaining that confidence than the current chief executive. Musk may be an innovation genius, but Mulally is a manufacturing genius. There is no more complicated manufacturing task than building a commercial aircraft, and Mulally was widely recognized as a superb head of Boeing Commercial Aircraft during the eight years he was its president. At Ford, he spent another eight years running the company that invented the assembly line. Musk, meanwhile, is jury-rigging assembly lines under tents — it’s come to that — while living in the factory for days at a time, which can’t possibly help his decision-making. Which man would you rather have overseeing a complex manufacturing business? It’s not even close. Tesla has been plagued by executive departures. When Mulally took over Ford, he got rid of some executives, but mostly he created a stable environment where executives trusted him — and each other — and where they all pulled their oars in the same direction. Tesla needs that too. When I met Mulally a few years into his tenure at Ford, I found him to be one of the most upbeat people I’d ever met. He is relentlessly cheerful, and that quality filtered down into the organization, creating an ethos of optimism. How optimistic are Tesla employees these days? To help boost morale, the rocker Jack White, a big Tesla supporter, gave a free concert to employees at its Fremont, California, factory. Then, it was back to the chaos. A cloud of optimism, based on meeting or exceeding goals, would help Tesla a lot more than the occasional concert break. I’m not saying Musk would have to leave the company he founded. 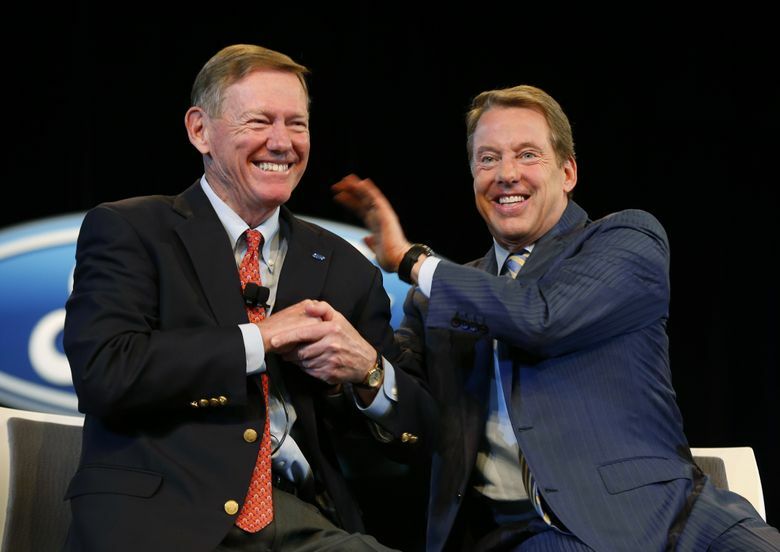 Bill Ford became executive chairman when he turned over the chief executive role to Mulally. Musk could do likewise, and continue to be the company’s chief innovator. Mulally would be the man to execute, to turn Tesla into a real car company that can churn out the thousands of vehicles a week it needs to become profitable. Would Mulally be willing to become Tesla’s CEO? I sent him an email, and although he replied cheerfully (of course), he wasn’t saying. But I suspect if Musk reached out, he would at least consider it. Besides, given Tesla’s problems, what’s the harm in asking?